﻿Thurman Barker is best known for his extensive contributions to avant-garde jazz, which have included at least 45 years with Chicago’s Association for the Advancement of Creative Musicians (AACM) and connections with jazz heavyweights like pianist Cecil Taylor, tenor saxophonist Sam Rivers and violinist Billy Bang. 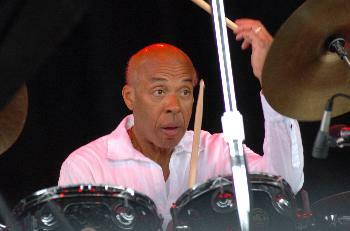 But the drummer’s diverse history has also ranged from theatrical work to gigs backing soul, blues and pop vocalists. Born and raised in Chicago, Barker moved to the East Coast in the ‘80s and has been a professor at Bard College for almost 20 years. Barker, now 64, covered a lot of ground during an in-depth interview. The New York City Jazz Record: You have played with a who’s-who of the AACM, including Anthony Braxton, Joseph Jarman, Muhal Richard Abrams, Kalaparusha Maurice McIntyre, Roscoe Mitchell and the Art Ensemble of Chicago. And you have been part of the Experimental Band since the ‘60s. Looking back, what are some of the most important ways in which the AACM influenced jazz? Thurman Barker: I can’t speak for the other members, but I think one way the AACM-influenced jazz was it showed that musicians could get together as an organization and distribute their music. I know there were jazz organizations around before the AACM; Charles Mingus had a jazz workshop in California and I’m sure there were some music organizations in New York. But we certainly were the first ones in Chicago to establish that type of organization. The AACM created an atmosphere conducive to musicians coming together and working out their ideas - that’s what the AACM was about. TNYCJR: The AACM sound has been described as a calmer, more reflective and contemplative approach to free-form jazz. Is that an accurate description of the AACM sound, in your view? TB: Once again, I can’t speak for the others. But speaking for myself, I wouldn’t use the word calmer. I think refined would be a better word to describe the AACM. I just came back from Europe with the Experimental Band and I didn’t feel that the music was calmer, it was more refined. The improvisation was more organized. It had more order to it. TNYCJR: You have worked with Cecil Taylor extensively. In what respects does working with Cecil differ from working with AACM musicians? TB: [Drummer] Steve McCall, bless his heart, brought me into Cecil’s band in 1986 and Cecil’s music was quite different from the AACM in the sense that his notation was different. Most music notation, from a traditional standpoint, is linear: you read from left to right. But in Cecil’s scores, the music was different. You read down, then you went up. TNYCJR: So far, you have released five albums as a leader on your own label, Uptee Productions: Strike Force, Rediscovered, Voyage, Time Factor and The Way I Hear It. Do you have any more albums planned for the near future? TB: Yes, over the summer of this year, I completed four pieces - and I have my sixth album coming out in 2013. Because I’m a full-time professor at Bard and an active jazz musician, I have not had as much time to devote to the label as I would like. But my dream is to have a label that presents music from percussionists and drummers. I’ve felt that as percussionists and drummers, we need to take care of each other. TNYCJR: In what ways was Chicago a beneficial place to grow up if one was interested in a career in music? TB: You could work in Chicago. During those years when I was active in Chicago, I was able to support myself and my family as a musician. I’ve never had a day job except for when I worked at the post office for six months and I did that just to see how the other world lives. But mainly, I have made my career playing and teaching music. In the ‘60s and ‘70s, Chicago was a great place for things to happen musically. It gave musicians a chance to work and think about doing something different. For instance, I remember meeting Maurice White when he was the drummer in Ramsey Lewis’ trio. Maurice used to run a jam session on Monday nights and members of the AACM would sit in. Maurice had an apartment in Old Town on the north side of Chicago; one time, I stopped by and his apartment was full of boxes he had packed. I said, “What are you doing? Are you moving? What about your gig with Ramsey Lewis?” Maurice said, “Yes, I am moving. I’m making a change. As a matter of fact, I’m going to start my own group.” Maurice had this great gig with Ramsey Lewis, but he was thinking beyond that. Of course, he went on to start Earth, Wind & Fire and the rest is history. So that’s why Chicago was a great place: it allowed musicians to work, but it also allowed them to think about the next level of their careers. TNYCJR: Some people don’t know that Maurice White had an indirect connection to the AACM. For example, Sherry Scott performed with the AACM and was a lead vocalist for Earth, Wind & Fire during their pre-Philip Bailey period. TB: That’s right. Exactly. Sherry Scott. And Donald Myrick, who played saxophone with Earth, Wind & Fire, was a member of the AACM. TNYCJR: “Little Hip-Hop”, one of the songs on your Rediscovered album, combines hip-hop and jazz. What are some of your thoughts on hip-hop? Did you think hip-hop would maintain its popularity for so long? TB: I have a son who is in grad school and a daughter who is in college and when I wrote “Little Hip-Hop”, I wanted to challenge myself and see if I could write something for their generation. Hip-hop is all around us and it came about because of technology. In the ‘80s, we had all this creative energy in our young people, but you no longer had music programs and creative programs in the schools. So with hip-hop, young people found other ways to express themselves creatively using technology. And I can see how hip-hop has evolved over time. It’s become more refined. It’s not as raw as it used to be. TNYCJR: Early in your career, you backed non-jazz artists like Marvin Gaye. TB: I worked with Marvin Gaye and Bette Midler when I had an association with theater. They would tour and when they came to Chicago, I was recommended as a good drummer to back them up. Marvin came to Chicago for three days and during rehearsal, the first thing he did was ask me if he could play drums. He was a drummer before he was a singer; I was struck that he could really sit down and play. TNYCJR: Although many people associate you with experimental jazz, one of your earliest gigs was playing with blues singer Mighty Joe Young. For more information, visit upteeproductions.com. Barker is at Community Church Of New York Oct. 26th. See Calendar.